Inside the April 2019 Issue (Issue No. 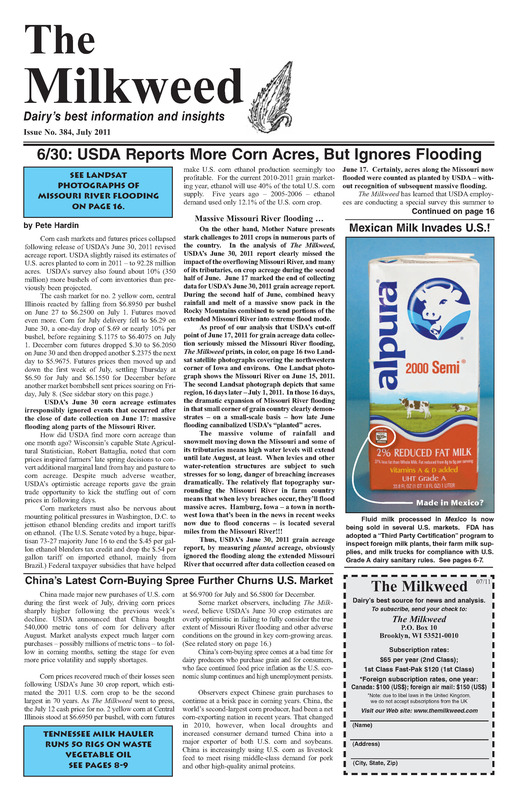 477): Stories of the Month: 1) P. 1 – Severe Flooding Disrupts U.S. Agriculture; All Prior Bets Off (p. 1) . . . 2) DFA Owns Stremicks – Plant “Milk” Processor (p. 1) . . . Feb ’19 Daily Mozzarella Output Up 10.3% Over ’18 (p. 1) . . . Jan. ’19 WI Milk Output +2.9%, But Cheese Production -4.8% (p.2) . . . DMD to Pay Dairy Farmers for January & February, Once Signups Begin (p. 2) . . . March ’19 Class III Price Jumps Up $1.15/cwt. (p. 2) . . . Dean Foods’ Financial Erosion Worsens Seriously (p. 3) . . . U.S. Senators Offer Bills to Review/Reform USDA Promotion Check-offs (p. 3) . . . More Strategies for Survival & Prosperity (p. 3) . . . “Net Income Attributable to DFA” Stolen from Members’ Milk Checks (p. 4) . . . ADPI Ready to Unveil “Dairy Protein Messaging Initiative” (p. 5) . . . Epic Heartland Flood: Causes, Consequences … and Recovery (p. 6) . . . WI Farmer Leads Relief Convoy to Help Flood-Stricken Nebraska Farmers (p. 7) . . . Arena Cheese’s Three Foundations: Quality, Relationships & the Deli Counter (p. 8-9) . . . Perdue Even Worse than Vilsack as USDA Chief (p. 10) . . . March 2019: Three Organic Groups’ Top Executives Dismissed (p. 10) . . . Hay Bale “Whole Milk Rebellion” Starts in PA (p. 10) . . . Wisconsin Cheesemakers Fed Up with Delays on CDR Project (p. 11) . . . “StopQIP Coalition” Supporters Submit Petition to CDFA (p. 12) . . . CA Producers Should Look at Depooling’s Impact (p. 12) . . . CDI to Join NMPF; Wants CA Standards for Entire Nation (p. 12) . . . Cheddar Prices Strengthen; Butter Holding Firm; NFDM Slightly Down (p. 13) . . . “Down Market” Erods Prices for Off-Grade Cheeses & “Trim” (p. 14): . . . Trump Administration Wrong to Life Brazilian Fresh Beef Restrictinos (p. 14) . . . “Fake Meat” – What to call that stuff? (p. 15) . . . Data shows cheese sales groth & Class I erosion (p. 15) . . . Flooding Boosts Contaminated Grain Worries: Testing Kits Available from Nelson-Jameson, Inc. (p. 16) . . . MMPA Delegates Dump Ken Nobis Off Board (p. 16) . . . . . . . . . SUBSCRIBE and Keep Informed About the Dairy Industry! Get smart about Your Milk Price. Subscribe Today! The Milkweed reports what’s really happening in the U.S. dairy industry. You can’t afford to miss the real news affecting your bottom line! Every month for the past 34+ years, The Milkweed has been providing subscribers with facts and insights about events determining prices for dairy commodities and farm milk. No other dairy paper matches the high-caliber reporting found in The Milkweed. Manipulations of Cheddar cheese prices at the Chicago Mercantile Exchange. Financial and anti-trust shenanigans of the largest dairy cooperatives. Regularly exposing fraud and abuse violating the integrity of consumer dairy products. Innovative dairy products, dairy marketing, and other good news. You’ll read about trends in milk supplies and demand for dairy products, analysis of dairy animal price trends, the weather … and many other factors that influence milk prices and the dairy farmers’ profitability. The Milkweed is written for the dairy farmer and other interested persons in the dairy industry. This paper is now in its 34th year of continuous publication, and counts about 6,000 subscribers. No advertising revenue influences this publication. Get smart about your milk price. Put dairy’s best publication to work for you. Subscribe today.